Love To Eat Right: Eat your flavonoids! What are flavonoids? They are substances virtually found in all plants, giving them brilliant colors. They function as antioxidants in the human body and help prevent cells from being damaged. We particularly benefit from them in a sense of protecting our muscle fibers from rupturing during long lasting activities, such as a marathon or long distance triathlon events. 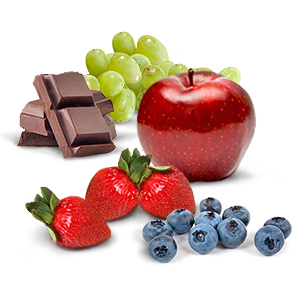 Free radicals are increasingly produced over the course of a race, the flavonoids have a neutralizing function. They are further known to reduce inflammation. Flavonoids can be found in all fresh fruits, vegetables, herbs and spices. The content is generally higher in the colorful parts of the fruit i.e. the skins. An exception are oranges, the white pulpy inside contains the greatest amount.